We had a really good day on Wednesday getting exactly as the weather forecast said. A good breeze from the S.W. so launches to about 1800′, nice and warm for the time of year and only 3 light showers all day. Best of all, for most of the day, we had brilliant sunshine. 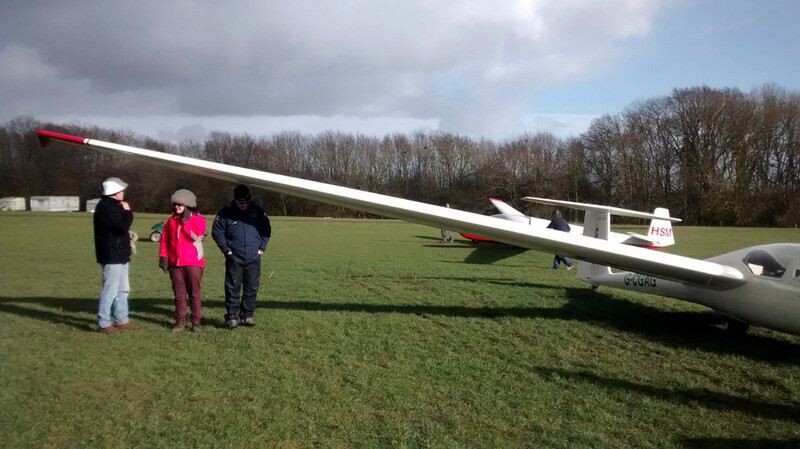 It was thermic for a couple of hours with several pilots managing decent flights. We flew from straight after the briefing until light stopped play. Many thanks to Tony P. for running a really good and busy day. We had all 4 two seaters out and also the K18 and Junior, all were well used. As it was a Wednesday our esteemed C.F.I. turned up at lunchtime and Tony put him straight to work. At lunch time there were 25 cars in the car park ! A brilliant turnout for a brilliant day. Longest Flight……………..25mins…. Well done to Paul R. in the K18. Other notable flights were 24mins by Phil Pa. and Nic J. in a K13…. 22mins by Andy S. and Tony P. in this years first outing of the K21. and finally 19mins by Vic A. in a K13 after a very long layoff. Average Flight Time……..10mins…. First time it has been double figures this year. Here come Spring…… From now on the only way is UP.